HCM City (VNA) – Vietjet Air kicked off its three golden-day promotion, offering 200,000 air tickets priced from zero dollars on July 12 to celebrate its two newest international routes. The promotion, which is available at www.vietjetair.com, applies on all international routes from Vietnam to Seoul, Busan (the Republic of Korea)/ Hong Kong (China)/ Kaoshiung, Tainan, Taichung and Taipei (Taiwan)/ Singapore/ Bangkok (Thailand)/ Kuala Lumpur (Malaysia)/ Yangon (Myanmar)/ Siem Reap (Cambodia) and for travel between September 1 and December 31. 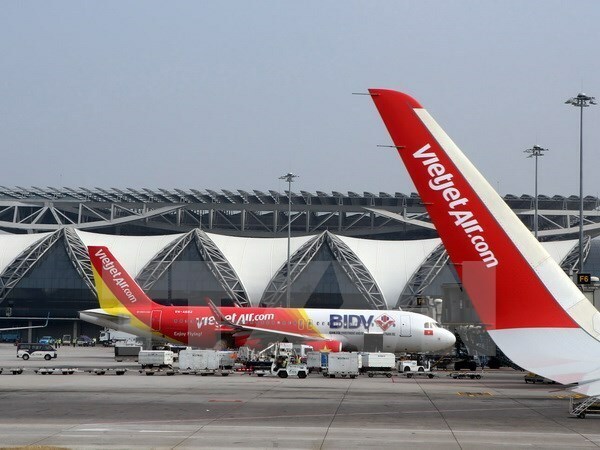 Vietjet’s new routes connect passengers between Seoul/Busan (the Republic of Korea) and Siem Reap (Cambodia), easing the travel of individuals, tourists and businessmen to the famous locations, the airline said in its statement. The Seoul – Siem Reap route is operated daily with tickets priced from 1.3 million VND (55 USD) for one way while the daily Busan – Siem Reap route will start from 1.6 million VND (70 USD) for one way. Earlier on July 10, Vietjet said it has partnered with Vietnam Heritage Photo Awards as a transportation sponsor. This is the 6th edition of the awards in celebration of the 72nd anniversary of President Ho Chi Minh signing the first decree preserving traditional and national heritages. “As the awards’ sponsor, Vietjet expects to introduce and bring Vietnam’s cultural and spiritual values to participants, visitors, the youth and international friends. This is a chance for photographers to show their passion for photography and showcase Vietnam’s beautiful country and people,” Vietjet managing director Luu Duc Khanh said. The airline will also offer domestic and international tourists free air tickets and exciting gifts when they enter the contest about Vietnam’s heritages.